They always say that the eyes are the windows to our soul and throughout history and mythology the symbol of the eye is recurring. With our eyes we see and percieve the world around us, we interpret our surroundings, recognise our friends and fall in love but they can always tell us a lot about ourselves. 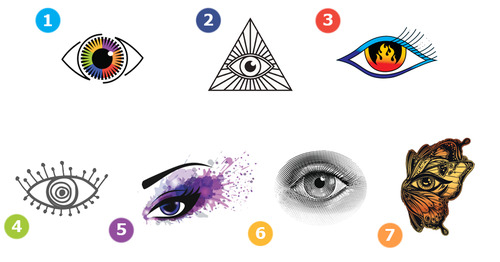 Look at the image below and pick which one you think best represents you - trust your intuition, each eye has a specific meaning and will uncover something special about you. Answer one: You are outgoing and honest. No matter who crosses your path, you always get along with them. You give your love to everyone who needs it. You're always there for your friends and family and help out whenever you can. The love you give to others comes back to you a thousand times over. That makes you a very happy person. This makes you very popular and makes getting ahead in your career very easy. Your wonderful essence makes you a person of success! Answer two: You are intelligent and reasonable. Never put off till tomorrow what you can do today! You live your life according to this proverb. That makes you an extremely successful person, because you never shy away from work. You always do what needs to be done perfectly. Answer three: You are determined and goal-oriented. Your approach to life sometimes reminds people of a tiger because you never back down from a challenge! You are a bold warrior who stands up for what's important. People love your exciting stories! The phrase "I give up" is something no one would ever hear from you! Answer four: You are lovable and charming. You are very in touch with your emotions. You always make the right decisions because you listen to your heart. Your friends love your sensitive and sincere approach. Everyone feels good in your presence! Once you've let someone into your heart, you never let them go. You always give 100 percent. But you're not just generous with your love, you're also a fantastic host. People love coming to visit you! Answer five: You are tolerant and open-minded. You were born with a love of adventure. Compared to other people, you're very open-minded and see every challenge as an opportunity. You're an inspiration to others because you live your life with true boldness! You approach unfamiliar people completely without prejudice. You give people the feeling that they matter, because you treat everyone with the same respect. You also have the wonderful ability to be able to forgive. For your friends you're irreplaceable! You're a real bookworm! Your curiosity and thirst for knowledge lets you discover the whole world. You've become an experienced person who always has sound advice on hand. In the future, people will come from all over to hear your wisdom! You would never leave a friend in the lurch. Whether it's diving into an ice-cold swimming hole in winter, comforting someone after they've had their heart broken or helping someone move, you're always there! The stars have made you a very loyal friend! You dance every chance you get. Whether that's through meadows of wildflowers or nightclubs. It makes no difference to you. Always seen with a smile on your face, you transform every gray day into a colorful adventure. Contagious and impulsive, your presence is always a cause of joy! You'd become an explorer if you could! You take on each day with eyes wide open and love learning new things! You will astound the world!